“An important, disturbing, and gripping history” (Kirkus Reviews, starred review), the never-before-told story of the computer scientists and the NSA, Pentagon, and White House policymakers who invent and employ cyber wars—where every country can be a major power player and every hacker a mass destroyer. In June 1983, President Reagan watched the movie War Games, in which a teenager unwittingly hacks the Pentagon, and asked his top general if the scenario was plausible. The general said it was. This set in motion the first presidential directive on computer security. 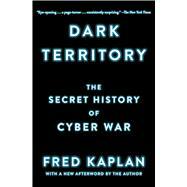 From the 1991 Gulf War to conflicts in Haiti, Serbia, Syria, the former Soviet republics, Iraq, and Iran, where cyber warfare played a significant role, Dark Territory chronicles a little-known past that shines an unsettling light on our future. Fred Kaplan probes the inner corridors of the National Security Agency, the beyond-top-secret cyber units in the Pentagon, the “information warfare” squads of the military services, and the national security debates in the White House to reveal the details of the officers, policymakers, scientists, and spies who devised this new form of warfare and who have been planning—and (more often than people know) fighting—these wars for decades. “An eye-opening history of our government’s efforts to effectively manage our national security in the face of the largely open global communications network established by the World Wide Web….Dark Territory is a page-turner [and] consistently surprising” (The New York Times).